Don't you just love the mess that somehow finds itself into every nook and cranny after a day of playing with your children at home? Lego bricks, stacking rings, wooden figures, dolls, plastic animals of all shapes and sizes, books, squeaky eggs...the list goes on. Wouldn't it just be lovely to not spend the end of the day crawling around on your hands and knees picking up endless toys? Now that I'm 33 weeks pregnant tidying up after Isabella is getting seriously tricky! Don't get me wrong Isabella helps, in fact she's pretty good at tidying up, but only when we're working as a team. 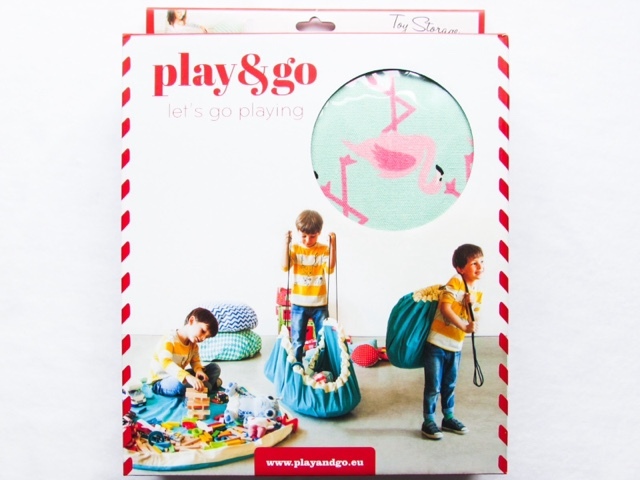 Play&go have come up with the perfect solution - the Toy Storage Bag. 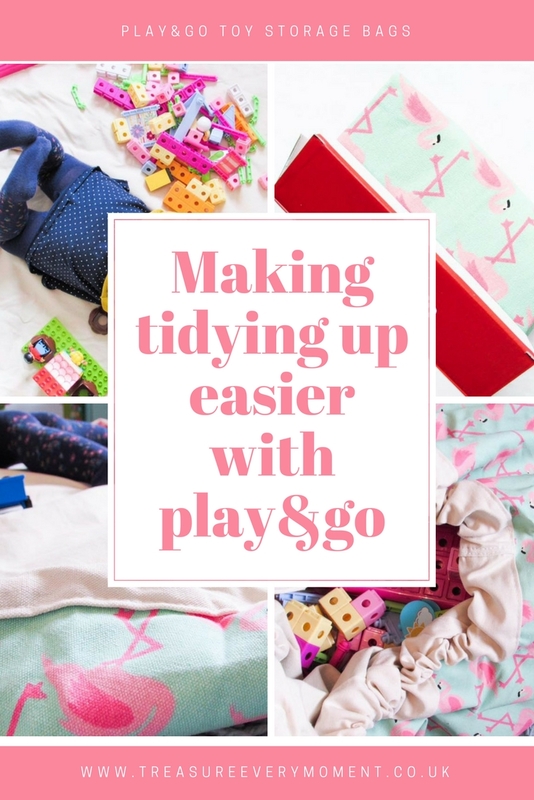 Not only can you use a play&go Toy Storage Bag for storing toys, but it also makes tidying up so much easier and quicker. 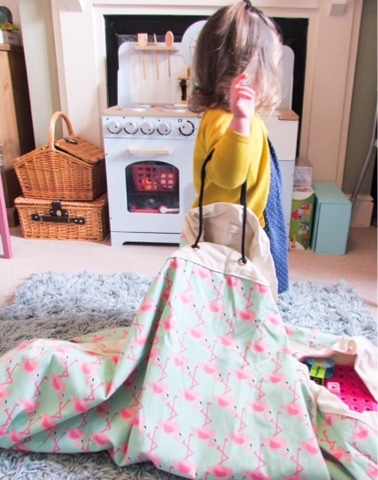 The bag opens up to create a large play mat, where children can enjoy playing with those hard to tidy up toys. 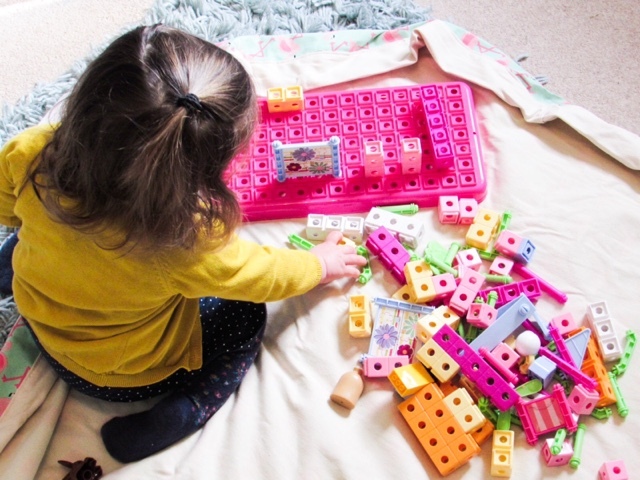 We were kindly sent the Flamingo play&go Toy Storage Bag (£29.99) and I was really impressed with the size, but if space is limited in your house then you can easily fold over the edges to make the play mat smaller. 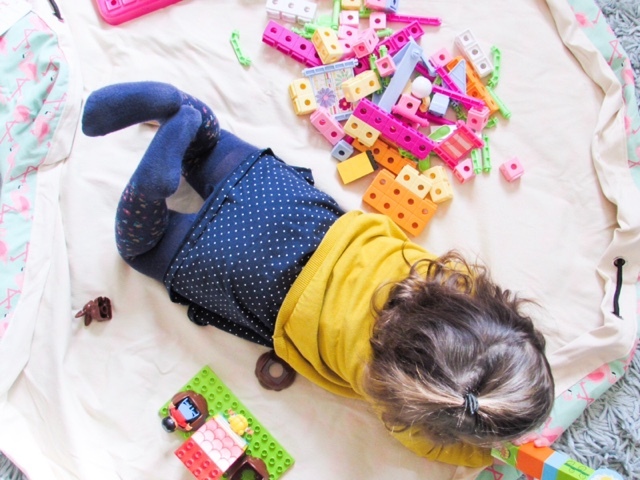 I pop it down on the floor in the morning and set up Isabella's wooden blocks, duplo and playmobil on top of it. This way I can guide the hard to tidy up toys I want her to use on the play mat, enabling me to have a relatively mess free nap time. Does anyone else find it hard to do anything else during nap time unless all of the toys are tidied away? I can't concentrate with lots of mess! When it comes to tidying up all you have to do is grab the two rope handles on either side of the lay mat and lift. 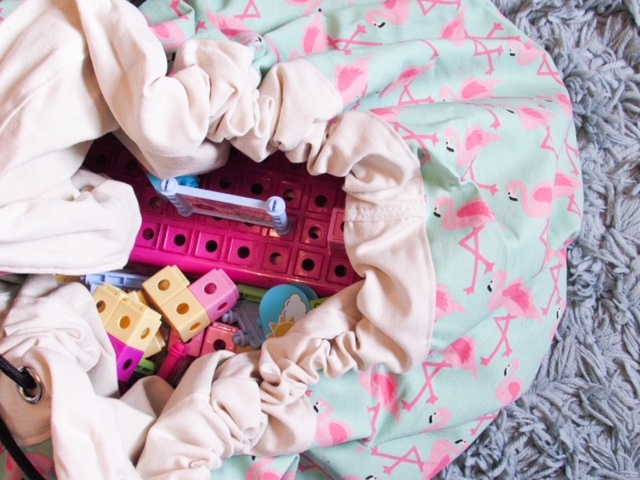 The rope gathers the material around the edge of the circle play mat, creating a bag that now contains all of your child's toys. You can then tie the handles to store the toys and with the beautiful patterned material on the outside it makes a lovely addition to a bedroom/playroom/living room. Isabella really enjoys pulling the handles herself, though she isn't quite tall enough so does need a bit of help. It is also then very quick to get the toys out later on in the day or the next day, just open the bag and play! All of their toys have been kept together, away from risk of being stood on (oh the pain of standing on a Lego brick - ouch!) or lost. 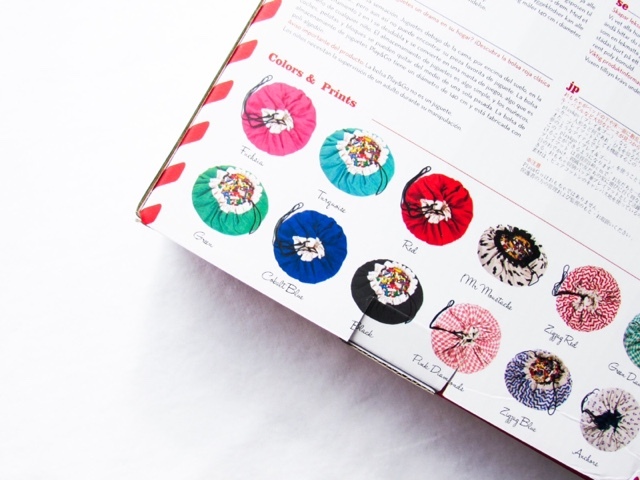 There is a colour, pattern and design to suit everyone, including: elephants, anchors, footballs, diamonds, badminton, pandas, an array of solid colours, superhero, zigzag and moustaches. 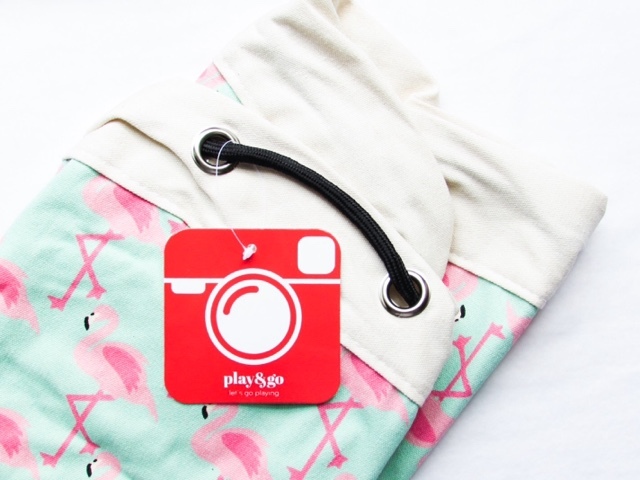 My personal favourites are the flamingos, elephants, anchors and panda - all so stylish yet cute! 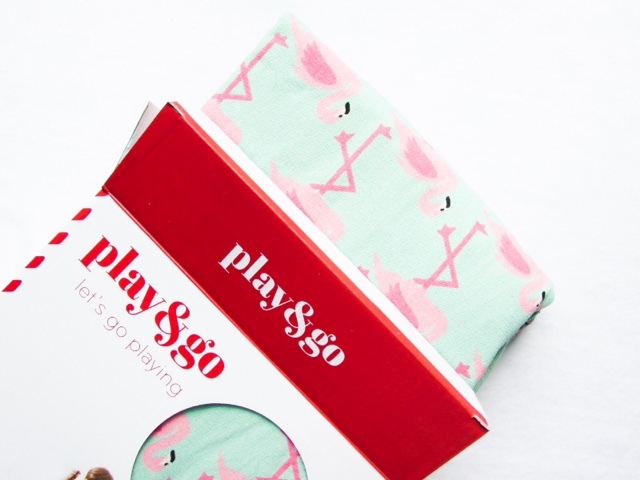 Have you heard of the play&go Toy Storage Bag before? What a genius idea! I could really do with one of these in my life...off to investigate further! These are a lovely idea. Jamie creates such a clutter of a mess some days. I can see these working really well in smaller lounges as a good way to quickly tidy up. I could use one of these in my life. My flat is constantly a tip! What a fantastic idea! 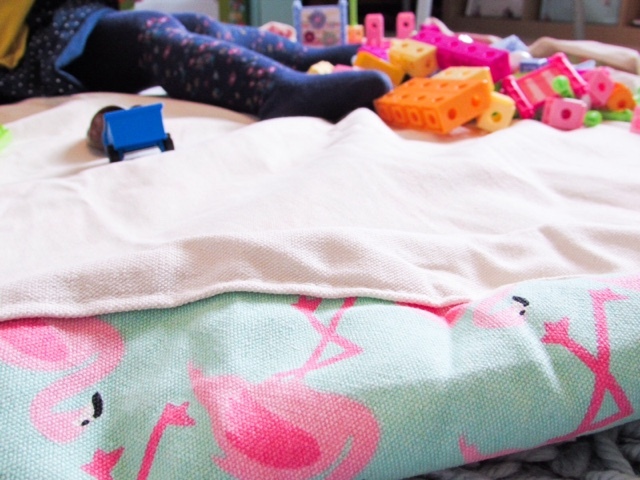 We love that you can use it as a play blanket and then sweep away all the mess. What a great idea. Especially when you go to grandparents houses. Oh wow I so need this in my life!!! With four children all I ever do is tidy up, this would revolutionise my life!!!!! how grea is this, they can literally open up the sack and sit on it as a mat, then once the little munchkins are up, we can just pull together the sack. About time a useufl kids toy storage. I make my kids tidy up so this is super handy. Thanks for the info. 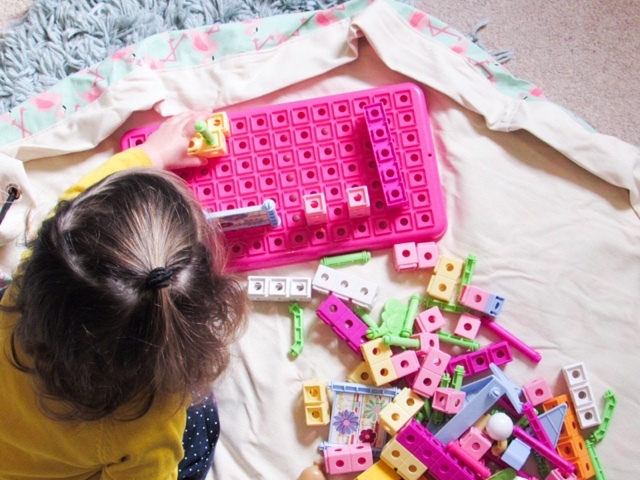 I think the Play & Go sounds like a genius solution for LEGO!